An Expanded Lecture with texts, music, images and speech. 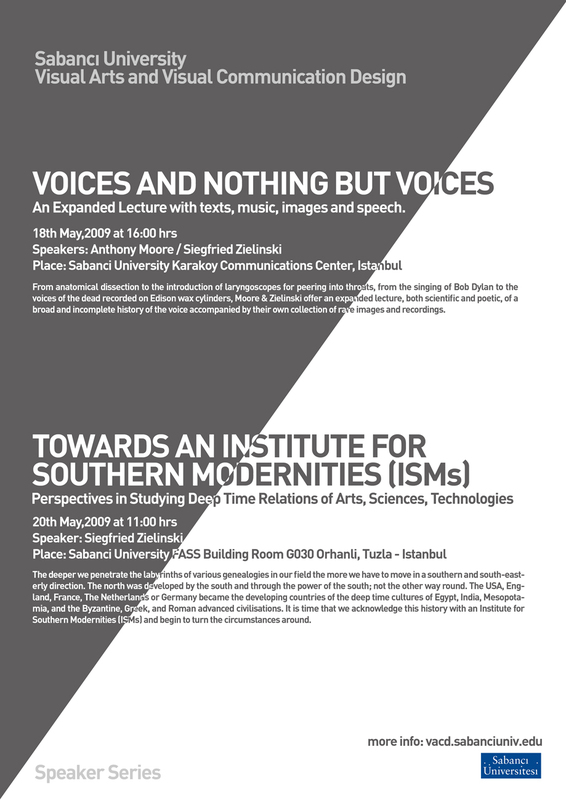 From anatomical dissection to the introduction of laryngoscopes for peering into throats, from the singing of Bob Dylan to the voices of the dead recorded on Edison wax cylinders, Moore & Zielinski offer an expanded lecture, both scientific and poetic, of a broad and incomplete history of the voice accompanied by their own collection of rare images and recordings. The deeper we penetrate the labyrinths of various genealogies in our field the more we have to move in a southern and south-easterly direction. The north was developed by the south and through the power of the south; not the other way round. The USA, England, France, The Netherlands or Germany became the developing countries of the deep time cultures of Egypt, India, Mesopotamia, and the Byzantine, Greek, and Roman advanced civilisations. It is time that we acknowledge this history with an Institute for Southern Modernities (ISMs) and begin to turn the circumstances around.